↑ Land, M. F.; Fernald, R. D. (1992). "The evolution of eyes". Annual Review of Neuroscience খণ্ড 15: 1–29. doi:10.1146/annurev.ne.15.030192.000245. PMID 1575438. ↑ Frentiu, Francesca D.; Adriana D. Briscoe (2008). "A butterfly eye's view of birds". BioEssays খণ্ড 30 (11–12): 1151–62. doi:10.1002/bies.20828. PMID 18937365. ↑ Nairne, James (2005). Psychology. প্ৰকাশক Belmont: Wadsworth Publishing. ISBN 0-495-03150-X. OCLC 61361417. http://books.google.com/?id=6MqkLT-Q0oUC&pg=PA146. ↑ Bruce, Vicki; Green, Patrick R. and Georgeson, Mark A. (1996). 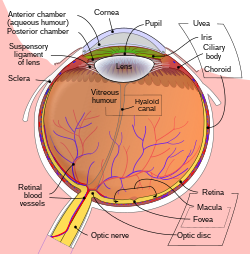 Visual Perception: Physiology, Psychology and Ecology. Psychology Press. পৃষ্ঠা. 20. ISBN 0-86377-450-4. http://books.google.com/?id=ukvei0wge_8C&pg=PA20.